I sit, and I stare at the Internet connectivity thingy on my computer. “Why aren’t you working faster, Wi-Fi? 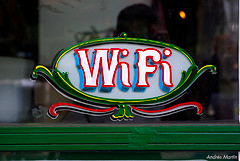 Why are there only four bars, now five, now four and yet you still won’t work?” Many Wi-Fi users are accustomed to the woes of the slow connection but hark! There could be relief in sight. The Wi-Fi Alliance, an industry group that actually owns the trademark for the word Wi-Fi and any products bearing that official stamp (who knew? ), is working on certifying products that will be able to run on a faster and more reliable wireless network technology. When you see that little stamp on products, it means that it’s certified to run on Wi-Fi, explains the Chicago Tribune. And here I was just thinking it was what we all called wireless Internet (slaps forehead). Anyway, the group is working on a certification program that will hopefully lead to a whole bunch of more advanced routers, smartphones, and computers hitting the market soon, says Greg Ennis, the alliance’s technical director. The new standard in Wi-Fi could be as much as four times as fast as the current technology and run on a new frequency band. What that all adds up to is sort of like going from a slow, residential road to driving on a new freeway with higher speed limits. “We expect that the users will see a significant increase in the performance of their applications,” Ennis said. This also means that in homes or apartments where there are a bunch of devices trying to connect to the Internet, the routers will be able to provide better coverage. But that new technology won’t come cheap at first, with the newer routers costing more than $150 compared to the usual $50 or so right now. New devices like smartphones going on the market soon will utilize this faster Wi-Fi, however, which could lead the way for other electronics to start making it affordable as well.